Robert Hammond Patrick, Jr. is an American actor, known for his leading and supporting roles in a number of films and television shows. Patrick dropped out of college when drama class sparked his interest in acting, receiving his first professional acting job in the 1986 television film, Eye of the Eagle. For much of the late-1980s, he lived in Los Angeles and had minor roles. In 1990, he landed a supporting role as terrorist O'Reilly in Die Hard 2. In 1991, he found greater mainstream recognition when he landed the role of the main villain, the T-1000, in Terminator 2: Judgment Day — a role described by Allmovie as "one of the most memorable roles in one of the most memorable films of the decade." He was nominated for the 1992 Saturn Award for Best Supporting Actor and the 1992 MTV Movie Award for Best Villain for his work and reprised the role for cameo appearances as the T-1000 in 1992's Wayne's World and 1993's Last Action Hero. He was nominated for the 1994 Saturn Award for Best Actor for his leading role in cult favorite Fire in the Sky and went on to star in such films as Cop Land, The Faculty, Walk the Line, Bridge to Terabithia, Spy Kids and Flags of Our Fathers. Patrick also starred in popular television shows such as The Sopranos, The Outer Limits, Elvis, The Unit, and The X-Files, for which he won the 2001 Saturn Award for Best Actor on Television and a nomination the following year for the same award in the "Best Actor in a Television Series" category, and was named one of "The Ten Sexiest Men of Sci-Fi" by TV Guide. He won the 2005 Jury Award for Best Actor for his role as Shay Riley in television film The Fix. Allmovie described Patrick as having "developed a solid reputation within the industry," with critics, fans and co-stars praising "his work ethic, personality, and consistent performances." Patrick, the oldest of five siblings, was born in Marietta, Georgia, the son of Nadine and Robert Patrick, Sr., a banker. His siblings are Richard , Cheri, Karen, and Lewis. He spent his early life in Bay Village, a small suburb of Cleveland, Ohio, while he moved around the country. Patrick didn't start to pursue an acting career until his mid-twenties. During his childhood years, Patrick didn't like to act. In third grade he refused to wear a required set of green tights used for a Peter Pan. He graduated from Farmington High School in Farmington, Michigan in 1977. Patrick was a track and field and football athlete at Bowling Green State University, although he dropped out before graduating when he found interest in drama and acting. After leaving college, Patrick got a job as a house painter and continued as such until a boating accident in 1984 in Lake Erie. He swam for three hours in order to save the others still stranded on the accident site, while he nearly drowned in his attempt. After the accident, he moved from Ohio to Los Angeles, California at the age of 26. His main income during the first years was a job at a bar. During the early years he lived in his own car. Patrick was then picked up for various small roles and cameos in low budget films. Looking back, Patrick credited his early appearances in films for his "tough-looking exterior." Before reaching fame with Terminator 2: Judgment Day, Patrick starred in various direct-to-video television movies. Prior to starring in Terminator 2: Judgment Day, he had a short appearance in Die Hard 2 as O'Reilly, a member of the terrorist organisation. In 1990, he was cast in the role of T-1000 in Terminator 2. James Cameron, the director of the film, said he chose Patrick for the role because of his physical appearance, which was needed for the role. During the filming of Terminator 2, Patrick was "broke", living at a cheap apartment with his girlfriend, Barbara Patrick, whom he married during filming of Terminator 2. Before getting the part, he was struggling and looking for a break in the film industry. He continued with saying the film gave him his career. After Terminator, Patrick landed roles in various feature films such as Last Action Hero, Fire in the Sky and Striptease . Because of his fondness for martial arts, Patrick starred in two martial arts films titled Double Dragon and Hong Kong 97, both released in 1994. His performance in Fire in the Sky caught the attention of The X-Files creator, Chris Carter. After David Duchovny distanced himself from the show during the seventh season, Carter immediately contacted Patrick to audition for the role. Patrick's brother, Richard, had previous worked for them by adding music for the soundtrack album The X-Files: The Album. 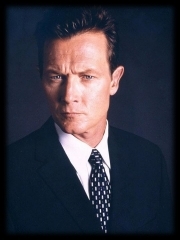 Patrick was cast as John Doggett in 2000, and to the surprise of many, his portrayal was met with much positive response from critics and fans alike. Because of the success of The X-Files, Patrick made several appearances on many genre magazines, with TV Guide going so far as to label him one of the Ten Sexiest Men of Sci-Fi. In 2000, Patrick appeared in three episodes of The Sopranos ("The Happy Wanderer", "Bust Out", and "Funhouse)") as David Scatino, a store owner struggling with gambling debts owed to DiMeo crime family capo Richie Aprile, and to Tony Soprano. Four years later, he made a guest appearance in the pilot episodes for Sci-Fi Channel's original series Stargate Atlantis, "Rising", as the military component commander of the Atlantis expedition, Marshall Sumner. He accepted the role, since he had worked with the same crew on The Outer Limits, a show which he appeared in during the early 90s. Patrick played Johnny Cash's father, Ray Cash in the Academy Award-winning film Walk the Line and Elvis's father, Vernon Presley in the Golden Globe and Emmy Award winning TV miniseries Elvis. He had a regular role on The Unit, and is scheduled to finish filming Lonely Street, a comedy caper where his role is that of a certain Mr. Aaron, a mysterious celebrity thought to have faked his own death and who is none other than Elvis Presley. In October 2006, he starred in the WWE Films production The Marine as Rome, the villain of the story. He also appeared in We Are Marshall as Marshall University head coach Rick Tolley, who lost his life when Southern Airways Flight 932 crashed 4,219 feet short of Huntington Tri-State Airport's runway in 1970. His credits also include a guest starring role in a single episode of Lost, as well as a recurring role as the voice of Master Piandao in the third season of the Nickelodeon animated series Avatar: The Last Airbender. He has also appeared in Meat Loaf's "Objects in the Rear View Mirror" music video with Will Estes. Director McG who directed Terminator: Salvation said that he wanted to reintroduce characters from former Terminator films. Saying that "I like the idea and the perspective for the next picture that you meet Robert Patrick the way he looks today, and he's a scientist that's working on, you know, improving cell replication so we can stay healthier and we can cure diabetes and do all these things that sound like good ideas, and to once again live as idealized expressions as ourselves." Patrick also starred in the Psychological thriller The Black Water of Echo's Pond, which was directed by Italian filmmaker Gabriel Bologna. Patrick married actress Barbara Patrick during the filming of Terminator 2: Judgment Day. Patrick and Barbara have appeared together in various media releases such as Zero Tolerance and The X-Files. He has two children, a son, Samuel, and a daughter, Austin (named after the police officer the T-1000 impersonates in "Terminator 2''). Almost every year, he does the Love Ride, a charity motorcycle ride held annually in Southern California. He is the current president of Chapter 101 of the Boozefighters motorcycle club. His brother is Richard Patrick, former guitarist of Nine Inch Nails and lead singer of the rock bands Filter and Army of Anyone. On 22 October 2010, the brothers sang guest vocals on the Filter song "So I Quit" on stage in Dallas, TX. Whole or part of the information contained in this card come from the Wikipedia article "Robert Patrick", licensed under CC-BY-SA full list of contributors here.